"හරි අපූරු අම්මාච්චි"- පොඩිත්තන්ට දැනුම ගෙනෙන විනෝදාත්මක කතන්දරයක් [කාටූන්]- Rajiv Eipe ලියා සිත්තම් කළ "Ammachi's Amazing Machines" සිඟිති කතන්දරයේ සිංහල ප්‍රතිනිර්මාණය. 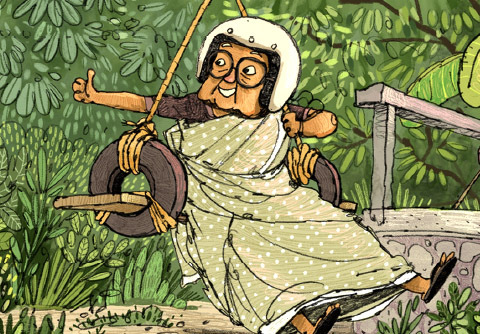 Sinhala Translation of the Kids Story "Ammachi's Amazing Machines" written (and illustrated) by Rajiv Eipe published on Pratham Books' Storyweaver Platform. Animations of this video were created based on Rajiv Eipe's illustrations of the same (above) book. "Ammachi's Amazing Machines"- © Pratham Books, 2017. Some rights reserved. Released under CC BY 4.0 license. This book was first published on StoryWeaver, Pratham Books. The development of this book has been supported by Oracle. Guest Editor & Art Director: Vinayak Varma.